Thaddeus flicked a pebble into the waters of the Jordan flowing amiably past him. He sat on a large, sun-warmed boulder wrapped in his thoughts. The pebble made gentle ripples on the placid surface. Thaddeus realized he was reminiscing again, a bad sign. It always happened as he contemplated some major change in his life. And he hated changes. Not that his life had been particularly quiet. Change and upset had confronted him at every turn in his life. And he had to admit that he'd brought much of his trouble on himself. When he'd decided he no longer wanted the responsibility of a wife and family, Thaddeus had signed onto a Greek ship. It could have been bound for anywhere--he didn't care. He wanted out. Weeks of pitching seas and blistering work convinced him he wanted out of sailing, too. Thaddeus jumped ship at his first opportunity and found himself wandering through the countryside of Judea. It wasn't much of an improvement, but at least he didn't have to worry about drowning. During this wandering time his conscience began to eat away at him. Children in the villages he passed made him wonder about his own, so faraway. Occasionally a voice in a crowd would match his wife's cadence, and remorse would fill him. He had no skill, so he just took odd jobs whenever he found them and kept moving--running away from himself. Then, when he felt completely mired down in self-pity, word came of the Baptist. The people in every marketplace spoke of nothing else besides the bearded prophet of the wilderness and of another strange word Thaddeus had never encountered before: Messiah. The people said the word with such reverence that it kindled a longing inside him. He went to see what the man might say. "Repent, for the kingdom of heaven is near!" Thaddeus knew he had much to repent of, and the Baptist's next words, though not really directed at him personally, made him squirm. "Who warned you sons of snakes to run from the coming wrath? And being sons of Abraham will not help you. God can raise up children for Abraham from these stones! The ax is already at the root of the trees, and every tree that does not produce good fruit will be cut down and thrown into the fire!" A haughty voice broke the stillness of the crowd. "Are you the Messiah?" The Baptist turned slowly to face the questioner, a richly robed priest, possibly from the Temple at Jerusalem. The contrast between the two figures struck Thaddeus--the priest, immaculate and bejeweled, his beard carefully trimmed and streaked with gray, a cynical expression twisting his face, and John the Baptist, clad in a camel's-hair coat, a leather belt around his waist, and a rough staff in his hand. The sun and wind had cut furrows in his face, and hard knots of muscle stood out on his arms. "I am not the Anointed One." In exasperation the man demanded, "Who are you? Give us an answer to take back to those who sent us. What do you say about yourself?" A long silence followed. The Baptist did not speak until he had the full attention of the assembly. The priest fidgeted but said nothing more. And when John spoke, Thaddeus could tell from the rhythm of his words that the statement was not his own. "I am the voice of one calling in the desert, 'Make straight the way for the Lord.'" That day Thaddeus waded out into the Jordan, and the Baptist dipped him beneath it. He became one of John's disciples, living in the desert, drinking in his words, feeling clean for the first time in his life. The Baptist knew everything about Thaddeus' past life but still treated him with love. Thaddeus had difficulty understanding why, since he knew he didn't deserve it. He became wholly devoted to John. But lately Thaddeus had become worried by some statements John kept including when he spoke to the people. The comments hinted of change, and as Thaddeus sat on the warm rock by the Jordan that morning, he realized he feared that change. He had no more time to consider. The crowds up and down the banks of the river milled restlessly. Without warning the Baptist appeared from the desert where he'd been praying. He leaped with the fluid grace of a desert animal to the top of a large boulder, his speaking platform. It took only seconds for the crowd to grow silent. "Repent!" his voice echoed among the rocks. "The kingdom of heaven is near!" The words still made Thaddeus shiver. But today, as happened more and more frequently, a question from one of the seekers interrupted John. "What are we supposed to do, then?" That, at least, was a new question, Thaddeus thought. "If you have two cloaks, give one to the man who has none. And if you have food, share it." A tax collector near John stood up. "What about us, teacher?" "Don't collect any more than you're required to." A murmur of assent grumbled through the assembly. The implied rebuke had found its mark. Behind Thaddeus a group of soldiers called out in a mocking tone to the Baptist. "And what should we do?" John replied without hesitation, directly and bluntly, but not in anger. "Don't extort money and don't accuse people falsely--be content with your wages." The people responded in whispers among themselves, whispers that included the word Messiah. Thaddeus felt proud of his master. But John did not stop. As if sensing the thoughts of the people, he spoke again. 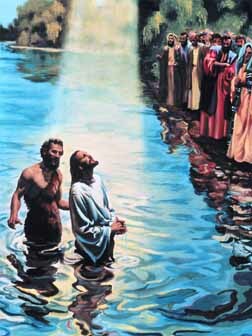 "I baptize you with water as a sign of repentance. But One more powerful than I will come, the thongs of whose sandals I am not worthy to untie. He will baptize you with the Holy Spirit and with fire. His winnowing fork is in His hand to clear His threshing floor and to gather the wheat into His barn, but He will burn up the chaff with unquenchable fire." Thaddeus slipped back inside himself. The Baptist had done it again, pointed too a mysterious Someone in the future more worthy than himself. The Christos. A cold slash of fear swept over Thaddeus at the thought of the change John had mentioned. But the crowd still pressed forward, asking for baptism at the hands of the desert prophet. Thaddeus watched, wrapped in his thoughts, as the crowd began to mill again, some filing into the water for baptism. John's voice grew suddenly strong, dragging Thaddeus away from his reverie. "Among you stands One you do not recognize. I myself did not know Him at first, but the reason that I came baptizing with water was that He might be revealed to Israel. He is the One who comes after me, the Lamb of God, who takes away the sins of the world!" Thaddeus' mouth dropped open. The Baptist had said "takes away the sin" not merely "forgives the sin." John stood waist deep in the Jordan, his attention riveted on a Man on the bank Thaddeus looked the Man over, but saw nothing unusual. Surely this could not be the One John meant. The Man waded out into the river until He faced John. "Will you baptize Me?" He asked. "I need to be baptized by You, and You come to me?" John replied incredulously. Smiling, the Man said, "Let it be so now. It is proper for us to do this to fulfill all righteousness." Reluctantly, the Baptist did as he was asked. As the Man came up out of the Jordan, water streamed off His face, beard, and hair. What happened next so astounded Thaddeus that when it was all over, he honestly didn't know whether he had really seen it or imagined the whole thing. The waters of the Jordan dripping from the Man's form began to sparkle like thousands of precious gems. Light from the sky streamed down and washed over the Man. At first Thaddeus figured it was some trick of the sun, until he realized that the sun was in the wrong place for that. And the light looked strangely different, almost liquid in substance. Thaddeus had the curious impression that since the water baptism was over, the baptism of light had begun. A small, fluttering object descended from within the pillar of light. It looked like a dove, but the light and the object's blurred, hazy movement convinced Thaddeus that it must be something more. It lit gently on the Man's shoulder. A titanic voice rumbled through the ground under him: "This is My Son, whom I love. I am well pleased with Him." As the voice faded so did everything else. In scant seconds all was as it had been. The Man waded out of the Jordan and began wringing out His garments. Those near enough to have observed what had transpired seemed like Thaddeus, too stunned to do or say anything. Quite frankly, he had begun to doubt his sanity. Then the Man happened to glance over at him. Their eyes locked for the briefest of moments, but in that short time Thaddeus knew the agonizing truth. This was the Christ, and He knew all about Thaddeus' sordid history. But the Man's eyes spoke no condemnation. The knowledge nearly tore Thaddeus apart. John had preached about this Man, but Thaddeus did not know Him, not like he knew John. The Baptist had befriended him, baptized him, cared about him, without expecting anything in return. Thaddeus knew he should go after the mysterious Man, but he felt afraid. The change was too much, just now. Besides, he couldn't abandon John, not after all he'd done for Thaddeus. He owed the prophet his loyalty and gratitude. Thaddeus felt a strong hand grip his shoulder. He turned quickly to find the desert man's black eyes burning into his. As if reading his mind, John spoke. "Thaddeus, my friend, I am not the Christ. He is. Didn't you see the Spirit of God light upon Him as a sign to us? The bride belongs to the bridegroom. The friend who attends the bridegroom waits and listens for him, and is full of joy when he hears the bridegroom's voice. That joy is mine, and it is now complete. He must become greater, I must become less." Seeing Thaddeus' hesitation, he spoke more sternly. "Whoever believes in the Son has eternal life, but whoever rejects the Son will not see life, for God's wrath remains on him." Without ceremony he gave Thaddeus a gentle shove in the direction the Man had gone. Then John the Baptist turned back to the crowd and waded into the water once more. Late that night Thaddeus stumbled into the circle of light cast by the Baptist's fire. Footsore and weary, he crumpled beside the welcoming flame. John looked him over carefully. "Why are you here, friend Thaddeus?" Thaddeus grimaced before answering, full of confusion, self-ridicule, and fatigue. "I couldn't find Him, master. He's disappeared completely. I searched all day and into the night without success. He must not want me." "No," John said, smiling, "I don't think that's right. He wants everybody." Suddenly John's manner changed, as did the rhythm of his speech. The reflection of the fire glazed his eyes. Thaddeus shivered at his next words. "He will come again. This time, be ready."